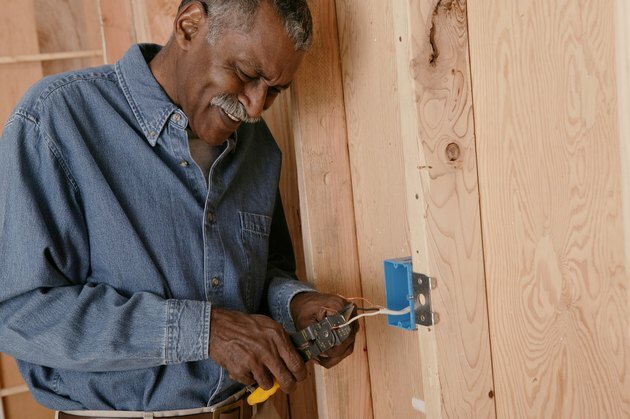 Many of your common in-home electrical repairs such as changing light switches, receptacles and light fixtures can be done yourself with the right tools and proper instruction. Converting a light fixture to a power outlet can be done in two ways. The first way is really simple and doesn't require any electrical knowledge or understanding whatsoever. To do this you simply purchase a screw in adapter that will screw into your light socket like a light bulb but it will have a plug (or two) on the end of it. At the end of this article you can find a link to this type of screw in light fixture receptacle. The second way to do this will require a little more preparation and work and that's what will be described below in the steps of this article. Purchase a receptalce and a receptacle cover (round or rectangle depending on your junction box–see step 8) from your local hardware store. Turn off the electricity to the junction box where you'll be working. Remove the light fixture that you wish to replace with a receptacle. To do this remove any glass covering or globe from your light fixture. Locate the mounting screws that attach the fixture to the junction box. Remove the mounting screws. Disconnect the wires from your light fixture by either unscrewing the wire nuts or loosening any screws holding the wires in place on your light fixture. Place the light fixture aside. If needed, cut off the stripped ends of the wires coming from your junction box and re-strip them, exposing about half inch of the copper conductor. Wire your receptacle. There should be a black, white and a green (or bare copper) wire coming from your junction box. You will need to use your needle nose pliers to bend a hook (screw loop) on the end of the wires coming from your junction box to hook around the screws on the receptacle. Simply grab the tip of your wire with the side of your needle nose pliers and bend the wire around the pliers making a hook in the end of the wire. Hook your black wire around the top brass screw on your receptacle and tighten the screw. Next hook the white wire around the top silver screw on your receptacle and tighten the screw. Finally, hook the green (or bare copper) wire around the green screw on your receptacle and tighten the screw. Now your receptacle is wired and ready to be mounted. Mount your receptacle to your junction box using the two screws connected to the receptacle. Since there was a light fixture in the place where you're now installing a receptacle, the junction box is probably one of your octagon shaped boxes which means that you will have to go to your hardware store to get a special round recaptacle cover for your receptacle. After covering your receptacle, turn on the electricity and test your outlet.